8-week transformation challenge results | So what? Now what? I want to be like a caterpillar. Eat a lot. Sleep for awhile. Then wake up beautiful. 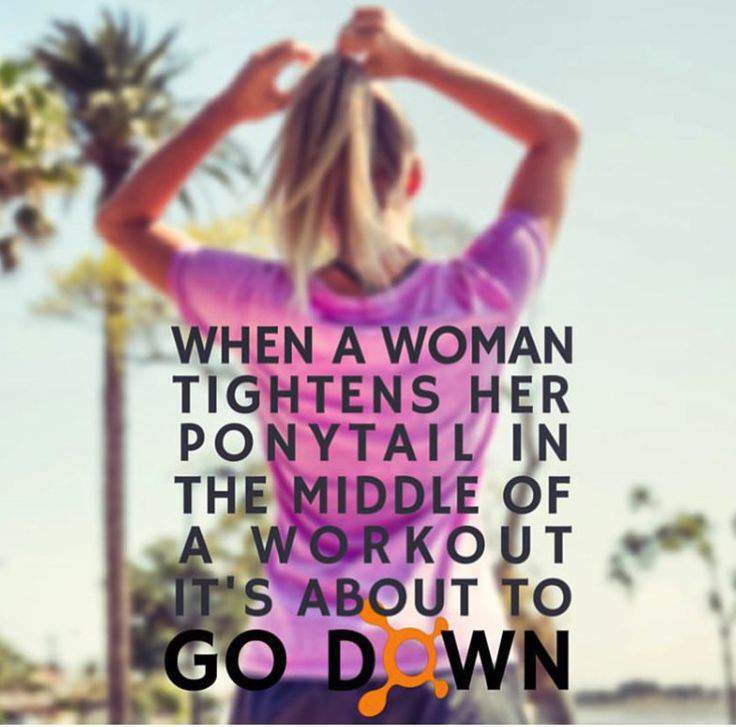 We’ve come to the end of the Orangetheory 8-week transformation challenge, and while I’m not exactly transformed, I am a couple of pounds lighter and a whole lot more educated. Achievements. Over the course of the challenge, I completed 24 Orangetheory workouts, earning 503 splat points (minutes spent in the orange or red heart rate zone) and burning an estimated 8,287 calories. I also completed six 3-mile runs, eight bike rides, and eight yoga sessions. That’s roughly 2,036 minutes of physical activity, not counting a few walks I didn’t record. I can truthfully say I enjoyed (almost) all of those minutes, and I definitely enjoyed the hours of satisfaction that followed each workout. Lessons learned. I’ve got the aerobic thing down, but my lean body mass remains on the lower end of the healthy range. It actually went down a little over the course of the challenge. The coach tells me if I am serious about increasing muscle mass, I need to go heavier on the weights, pointing out that I am healthy and fit and capable of lifting more than I have been. Of course, there is also a nutrition component to gaining muscle. There is much conflicting information about how much protein is enough, but based on my age, size, and activity level, the American Dietetic Association recommends that I consume 66-118 grams a day. Am I close to that? I honestly have no idea, but I plan to track protein for a couple of days and see whether that may be a contributing factor to my disappointing muscle mass results. Achievements. I have made great strides in eating cleaner, healthier, home-prepared foods for breakfast, lunch, and daytime snacks. For a long time I told myself that giving up the frozen entrees and other processed foods would be too time-consuming and difficult. Once I made healthy eating a priority, I realized it isn’t that much work and it’s fun. Sunday is food prep day, and I actually look forward to it. I make lunches for the week and sometimes breakfast. In addition to the home-prepped meals, I eat fresh fruits and vegetables, nuts, greek yogurt, oatmeal, and the like. Larry and I have also been cooking new healthy recipes for Sunday dinner. Lessons learned. The changes I’ve made have me feeling better. I don’t get the bloated, heavy feeling I often got after a frozen entree lunch, even one labeled as “healthy.” I have more energy and I’m sleeping better. What I am not doing is losing much fat. 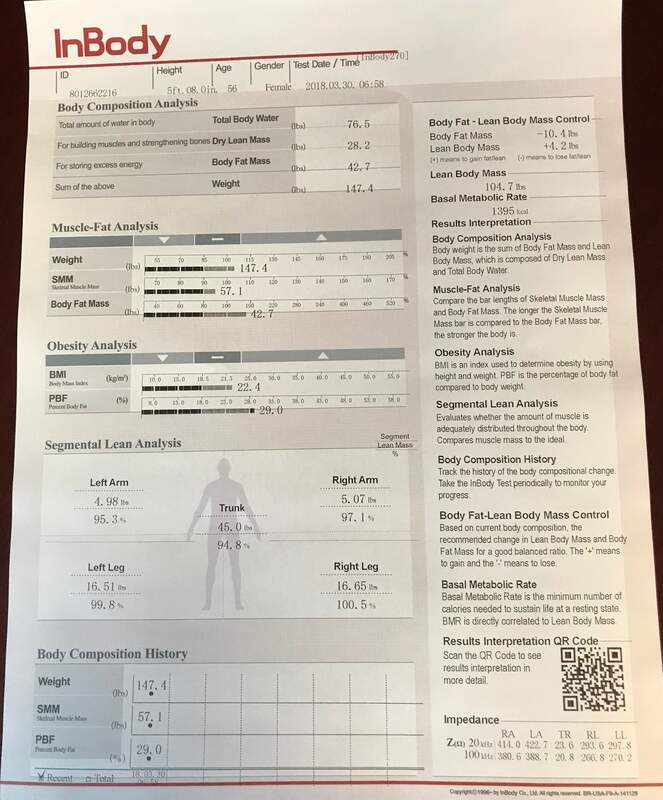 In eight weeks, I lost 1.4 pounds of fat, not overly impressive, and leaving me slightly above the healthy range for body fat percentage. I attribute that to the frequency with which I eat out and the nightly sweets. My knee jerk reaction is to say I can’t give those up, but then I remember how hard I resisted the clean daytime eating. I just have to decide what’s more important to me. Achievements. I lost three pounds during the challenge, about half of which was fat. I remain within the healthy weight range, Body Mass Index (BMI), and lean muscle mass–though just barely. Lessons learned. 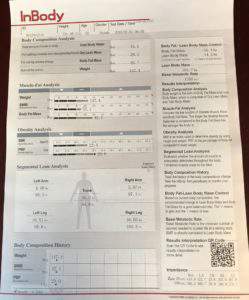 Overall, I am fit and healthy; however, my body fat percentage is 29 percent, which is 1 percent over the healthy range. Ideally, I would lose 10.4 pounds of fat and gain 4.2 pounds of muscle. The lesson I take away from the challenge is that change is hard and transformation won’t happen within eight weeks. I also learned that change is not impossible, and transformation happens one step at a time. I am closer to the goal of optimal fitness today than I was eight weeks ago. If I put in the work, I will be even closer eight weeks from now. Workouts. I will continue with the same workouts, but the mix will be changing a bit, as I start training for the Utah Valley 10k. I anticipate two Orangetheory workouts per week, upping the weight I’m lifting, maintaining a focus on proper form; three runs a week, gradually increasing in distance; and one yoga session. Nutrition. I will continue with the clean daytime eating and at least one intentionally healthy dinner a week. When eating out, the focus will be on selecting the most healthy option I will be satisfied with and eating slowly, stopping when I am satisfied (never overfull). I commit to replacing my usual nightly treat with licorice tea or a small square of dark chocolate at least half of the time. Thank you to everyone that stuck with me through this challenge and cheered me on. You guys are the best! Exercise alone or with others? I’ve loved following your challenge Christie. You’re commitment to improving your health has been inspiring. Your results are really great for such a short time. Good luck for your future in fitness. This challenge has set you up with very good new habits. Thank you Jennifer. It was a positive learning experience for me, and I’m definitely moving in the right direction. I appreciate your encouragement along the way! While you may not have hit all your goals, you have inspired me! I put on my new FitBit yesterday. Luckily it was a walk & talk day so the 4 mile park hike help with a great day one step number! Today’s rain and computer-work (taxes) plan won’t help. I’ve been snacking more on fruits and I’ve ordered the Hello Fresh meals. I’m not sure I’ll keep up with them; I’m giving it 3-4 weeks. I hope they spur me into cooking fresh & healthier meals on a more regular basis. Then I can switch over to my own planning (they are costly). My preferences – I actually like both fruits and veggies! My challenge is to have them accessible. Exercise with others – I need the accountability! Yet, I don’t like any gym I’ve ever been in… hence my yoga class and walk&talks. Salty for sure. I used to be sweet, but now, a small piece of chocolate can satisfy and more is too much. But salty… potato chips seem to come in single size bags, no matter the size! I have to make sure I use my (hand-made small) snack bowls to not overindulge! Thanks for sharing your 8-week challenge. As I said, you have inspired me to make some changes in my own healthy living quest. Thank you for the kind words, Pat. It’s always nice to hear that you’ve inspired someone, right? What a great start to your own health goals. I love the idea of a walk & talk. 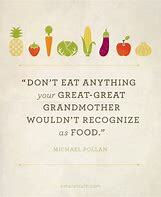 I also love fruits and vegetables, but have leaned more toward fruit in the past. I am trying to even out that balance now. I like both salty and sweet, which is a problem for me. I seem better able to control the salt, though. Have a healthy, happy week! I’m impressed with your diligence, good job Christie! I honestly love salty and sweet as well as both veggies and fruit equally. However I usually prefer to work out alone. Thank you Cindy. I especially like salty and sweet combined–or one following the other. 🙂 I have tended toward fruit, but am consciously working in more vegetables now. I do a mix of individual and group workouts. Do I sound indecisive or what? Hi, Christie – Congratulations on your perseverance and successes with this challenge. Thank you for sharing and inspiring us along the way. I’ve picked up several tips (especially regarding healthier eating habits) which I have already begun to implement! Excellent Donna. That was probably my biggest takeaway from this challenge–eating healthy can taste good and be fun! Well done in completing the challenge Christie and good for you training for a 10k. The Saturday Sisters and I are now in training and I kick off with an 8km run for the Mother’s Day Run that I do each year. I think having a challenge keeps us focused and you have done so well. Thanks for sharing with us at #MLSTL. Thank you Sue. I agree having something to train for helps keep you focused and energized. Good luck on your Mother’s Day run and thanks again for hosting #MLSTL. So true Leanne. It’s all a tradeoff. Swearing off sweets or giving up fried foods completely isn’t worth a couple of pounds for me. 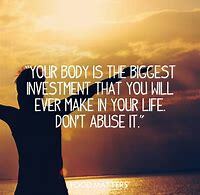 However, cutting back on those things and making room for more nutritious choices for better health and keeping the scale from going up every year is worth it. And I’m with you–darn that midlife metabolism. The struggle is real! Thanks again for hosting the MLSTL link up! Good for you for keeping at it and realizing that – even if not all goals were obtained – you made great strides on your path to a healthier you. Thank you Janis. I have to remind myself that progress, not perfection, is the goal. Have a lovely day! 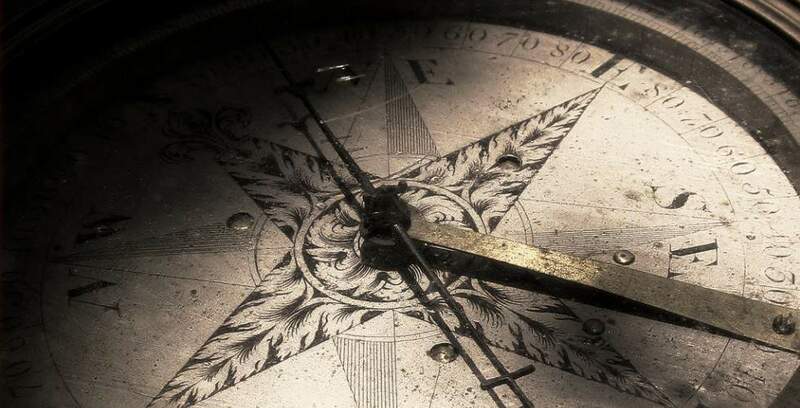 You may not have achieved big shifts in numbers but it is the shift in thinking which counts more anyway and it sounds like you have nailed that. It’s just another ongoing journey really isn’t it. As for me, I would choose vegetables over fruit every time, even though I love fruit. Sharing on my social media. Thank you for the encouragement, Jan, and for the shares. It’s so true that the thought process is the first thing that has to shift for any change to take place. I’ve always been heavier on the fruits, but that’s another thing that’s shifting. Well done on completing the challenge. think if you feel healthier and fitter, then it’s a win. If you are sleeping better it’s a double win! Perhaps we get too caught up in BMI and things like that as we get older. I really do think our bodies change all the time, and as long as we do healthy things 80% of the time and naughty things only 20% of the time, maybe that’s good enough. Good point, Jo. I’m trying to focus most of my attention on things that are in my direct control–what I eat, my activity, resting–and less on the numbers that seem to have a mind of their own! Have a wonderful day! Thank you Debbie. It’s definitely more challenging to maintain or lose weight as I age, but as long as I’m healthy, like you, I don’t panic. I refuse to live a life of deprivation to maintain a number on the scale. Have a joyous day! Fruits AND veggies, love them both! I exercise alone. I am SUPER self conscious about how I look and even how I breathe when I work out. I am ALL ABOUT THE SWEETS!! (which is why I gained so much during this holiday season in Germany) Back on track now, but it’s a struggle for sure! I agree fruits and veggies are both wonderful, especially when you can get them fresh from the earth. I’ve exercised alone most of my life, but recently found a love for a fitness class. I like the energy of the group and the coach making sure my form is correct and pushing me a little when I go too easy on myself. I’m with you on the sweets, especially anything homemade. Thanks for playing along. Have a lovely day! Wow! Congratulations! You’re truly an inspiration. I admire anyone that can stick with a program and get results. Again, an absolute inspiration. I wish I could condition myself when it comes to weighloss. 🙂 Rock on girly! 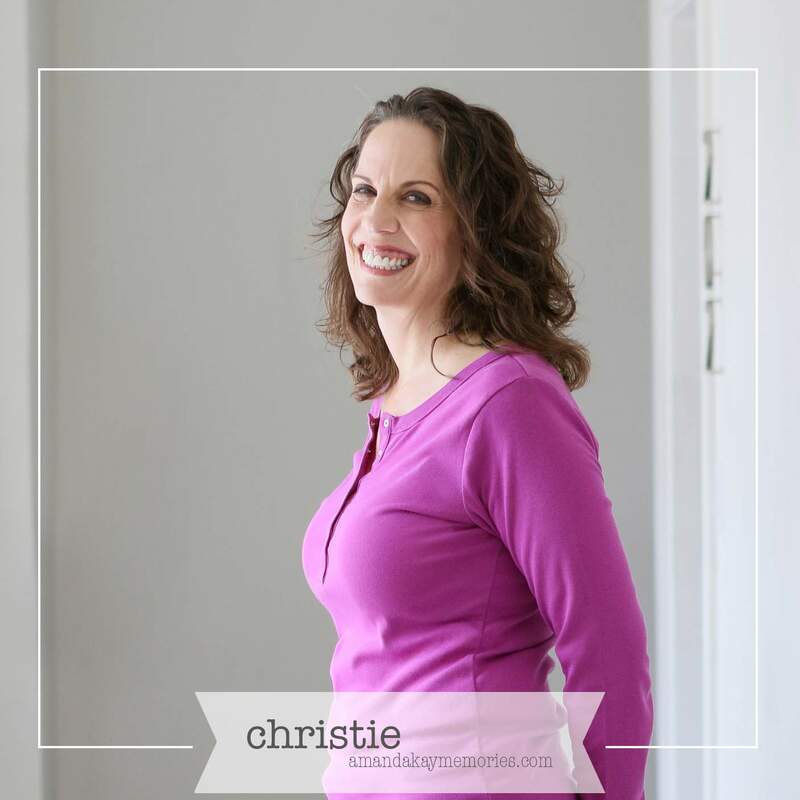 Congrats, Christie, for your perseverance and achievements! It’s good to have a goal like the 10K to keep your focus and momentum. My preference: Fruits, both workout alone and with others, Sweets although I do not crave them at all. A bag of cookies or candies at my place is usually consumed by my family and not me. Thank you Natalie. Training for a race or participating in a challenge definitely helps keep me motivated. I can ignore a bag of store-bought cookies or candy (unless it’s Swedish Fish! ), but I love baked goods and I do crave some kind of sweet in the evening. Thanks for playing along! You have done a wonderful job on keeping with your goals. I have found if I give up sweets after three or four days I don’t crave them any longer. I follow a low carb diet 90% of the time. Thanks Victoria. I’m not sure I’ve ever gone three days without sweets. Hmmm… I could have a problem. This is fine when there is a goal and it is getting closer every day! I know that it’s not easy to give up fast food, but it’s interesting, tasty and useful. Good luck in achieving the goal! Hello Alice and welcome. Thank you for the encouragement.